Inspite of its extensive use and popularity, many users may not be fully aware of how email communications actually work. If you are in the process of setting up a server infrastructure, then you will need to gain in-depth knowledge about email configuration. Email is enabled by two most important protocols including Post Office and Internet Message Access Protocols, more commonly referred to as POP and IMAP. Unless you have an in-depth understanding of these, it would be impossible to appreciate the working of email communications. 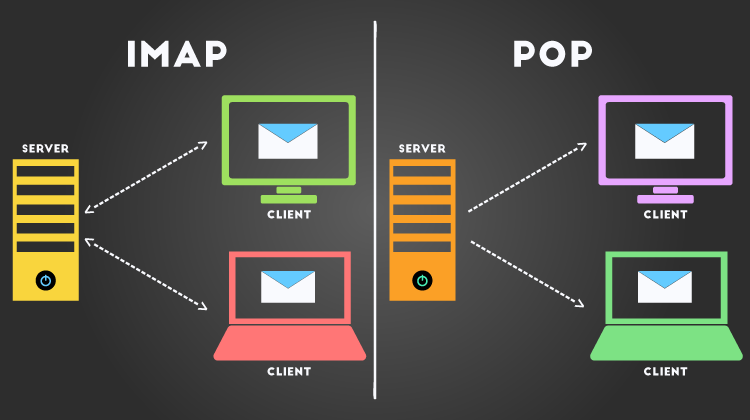 IMAP and POP are developed to facilitate easy access to emails of individuals via a remote server facility that is operated by email hosting providers. Although these are used for the single purpose, there is a vast difference between them in terms of their working in addition to their merits and demerits. This leads us to study the differentiating factors for complete understanding of IMAP and POP. It would be relevant to know the history of the two most celebrated email protocols that were initially developed in the early eighties. The early protocols were not directly associated with servers, although users could leverage computers for accessing their emails. Basic working of POP has not undergone major change because even the new versions of this protocol allow downloading of emails by establishing connection between a local machine and remote server in response to the use of username and password. After successful implementation of preliminary version, POP2, as well as POP3, were developed after only a few years following launch of the basic POP version. POP3 has been the most sought after internet protocol in recent times. As POP was undergoing alterations, another optional version of POP was also being developed which came to be known as Internet Message Access Protocol or IMAP. Unlike POP and its different versions that do not facilitate storage of emails on server for a longer time, IMPAP maintains emails on the server for an indefinite period. This allows users to access their emails from any type of device subject to a successful login by using user credentials. Even though, POP and IMAP are apparently identical we can find several differences between these by analyzing impact of thee protocols on users owing to their distinct ways of functioning. Considering POP to begin with, users can continue to maintain access to downloaded mail unless they lose access to the device or they happen to inadvertently delete it. POP is devoid of any assurance as far as email backup is concerned. This feature of POP can also be used to your advantage since the downloaded mail can be accessed even in an offline mode as long as you are using the same computer or device. Even in the event of lost connection with email server, one can securely maintain the email including attached files. In case of IMAP the pros and cons are radically opposite because the most notable feature of IMAP is the robust backup support which makes sure that user’s emails are securely stored on a remote server. This also guarantees unrestricted access from any location or device as long as the availability of internet is ensured. By understanding these advantages and disadvantages, it is easier to find ideal use cases of POP and IMAP. Thanks to the amazing growth in internet connected devices backed by guaranteed internet connectivity, IMAP is more suitable for modern and always-connected users. If you thought that the days of Post Office Protocols were numbered, then you need to think twice because it can continue to support users of a dedicated computer for management of email communications. POP email hosting providers can allocate a server for storage of emails thereby guaranteeing backup support for emails. Email hosting companies have been instrumental in providing IMPAP as well as POP solutions in accordance with requirements of users. One can always make a choice between the two protocols instead of meekly accepting what is being offered. Having selected the email protocol of your choice, a user can proceed to get the server configured in order to support either POP or IMAP. Once the server is configured for POP or IMAP, the service provider will allow setting up of SMTP protocol to facilitate outgoing emails. Unless you are aware of merits and demerits of the protocols in addition to specific use cases, it would be difficult to set up a server. Thanks to some of the reputable email hosting providers, it is easy to choose between IMAP and POP to explore the most relevant advantages according to specific objectives of hosting. POP assures dependability and safety of emails in terms of access in single device environments. There is however no syncing facility between different devices and it is essentially suitable for dedicated machines. On the other hand IMAP is designed for anytime anywhere email accessibility irrespective of devices.